AT MY TRIAL PRACTICE WEBSITE . . . "You're Going to Use a Document in a Deposition? Be Sure to Read It First." Law school is a different experience for every student. Some worry more, some work more, some love it, some hate it, some are sober, some are drunk from day one. A description of the 1L year from a single viewpoint is like looking at a single pixel on a TV... it's impossible to get the whole picture. I enlisted others in my summer starting class to share their thoughts about finishing 1L. Some give advice, some tell stories, but all are unique to their writers. Together, these essays form a more complete picture of the 1L year than any of us could do on our own. If this isn't enough advice for you, there's also Blawg Wisdom, an entire weblog devoted to advice for law students. And there's also my own contribution to the literature of law-school advice, "A Post About Issue-Spotting on Law School Exams." TWO YEARS AGO AT LEGAL UNDERGROUND . . . "The Circle of Advisors, One of an Ongoing Series of Essays on 'Things Important to Every Lawyer'." This special issue of Blawg Review #59 will remain open for submissions and recommendations of law blog posts that are especially fitting for Memorial Day. Your editor will be updating this issue of Blawg Review throughout the day, linking here the best Memorial Day posts found on law blogs today. Look for next week's roundup at divine angst, where Kristine is taking over co-authoring duties for Energy Spatula. In two weeks, the roundup will be back here. You can also find some other recent roundups in the "At the Law Schools 2" category, and sixty or so older roundups from the 2004-2005 era here. ANNOUNCING THE NEW CO-AUTHOR OF THE WEEKLY LAW SCHOOL ROUNDUP . . . During the past months, I've had a great time working on the Weekly Law School Roundup with Energy Spatula of Will Work for Favorable Dicta. It was Energy Spatula who resurrected the roundup after I killed it off, and I'm glad she got me interesting in returning to the feature. If you've been paying attention, we've been rotating the roundup each week at our respective weblogs. Now Energy Spatula is moving on. Her last official act was to choose a replacement. To that end, I'm happy to announce my new co-author: Kristine of divine angst. If everything works according to plan, Kristine's first roundup will appear at her weblog next Sunday. AT MY TRIAL PRACTICE WEBLOG . . . "Improve Your Legal Writing with LegalWriting.Net." 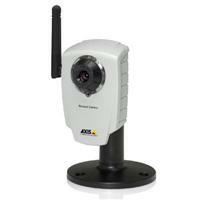 It's the Axis 207W Wireless Network Camera. It's both a webcam and a computer housed in a single unit. Once it's turned on inside your home, you can watch what's going on from any computer with an Internet connection. Use it to make sure the dog is getting fed, the kids aren't hitting each other over the head with bricks, or, if you have a weblog, that your readers aren't burglarizing your home because they've heard you were going to be out of town for a few days. Peace of mind for only $300. At some point, however, my wife Andrea, who is apparently suspicious of people who read weblogs, said I had to stop announcing when I'd be out of town. She said that to do so would leave the family alone in the house at the mercy of the next Legal Underground reader who also happens to be a burglar hoping for an easy score. I can't say I have the same concerns. On the other hand, I'm not the one who's left at home alone. Anyway, as a bit of market research, I'd appreciate it if any criminals who are reading this weblog would please identify themselves in the comments. At least then we can get a handle on how many of you there are.